Two local soccer enthusiasts, Burt Walker and John Crichton, have rewarded three members of the local soccer team for scoring goals in the June 20th clash with Nicaragua. The goal scorers, Shandel Samuel (2), Marlon âThirstyâ James (1) and Jamal Ballantyne (1) made sure that Nicaragua went under to Team SVG four goals to one. Walker, who is the Operations Manager at Shell Antilles and Guianas Limited, while handing over the cheque at the companyâs compound said that the only thing that win games is goals. 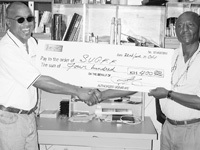 âI chose to offer the incentive to help encourage the playersâ, said Walker, who also donated a number of T-shirts to the soccer cause in 1992. Walker, who said that he played soccer only on the secondary school level, said that he hopes that other persons or organisations can come out and give incentives to the players. He also urged the Government to come on board and support the local lads. Crichton, who is the manager and owner of Right Stuff, also urged other persons to join in and support the local players. âWe at Right Stuff decide that the team needed all the encouragement and support that they could get,â said Crichton while explaining why the incentive was given. Crichton, who enjoys soccer, said that he will be making similar pledges in the future. He is hoping that other business people come on board and offer incentives. PRO Thomas thanked Crichton and Walker on the associationâs and playersâ behalf. He described the donations as something that is very commendable and said that he is hoping that other institutions or persons follow in the footsteps of Crichton and Walker. Team SVG takes on Trinidad and Tobago on Wednesday August 18 at the Arnos Vale Playing Field 1 in their first second round World Cup 2006 qualifier game. Some of the other games are slated for September 4 in Mexico against Mexico, and September 8 at Arnos Vale against St.Kitts and Nevis.